Logistics « Global Market Insights, Inc. In a bid to concentrate on their core competencies, renowned firms have been outsourcing their operations. Outsourced Customer Care Services Market is expected to carve a profitable growth graph subject to this very factor. 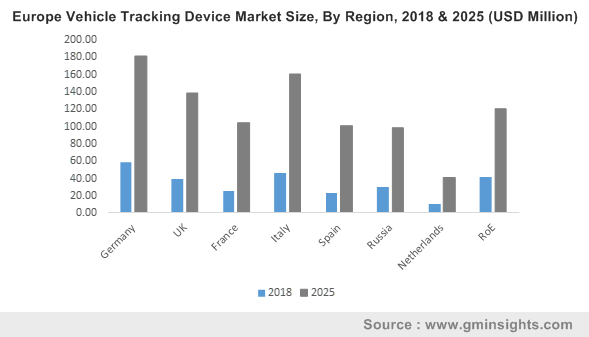 As per statistics, this market is anticipated to cross USD 110 billion by 2024, with a CAGR projection of 6% over 2017-2024. Outsourcing services provides several benefits to the firm, including improved operational flexibility, lowered overhead costs, and an elevated level of assured services. Of late, the demand for mobility services on a multitude of platforms have been increasing, which will further drive outsourced customer care services industry over the years ahead. Outsourced customer care services market is moderately fragmented and involves the presence of numerous SMBs. In order to sustain their business position, companies have been focusing on enhancing their service portfolio. In addition, the tried-and-tested strategy of acquisitions is also a rage in outsourced customer care services industry, which players have been adopting, in order to gain global prominence. For instance, Infosys and Microsoft Corporation had partnered in 2015 to provide the Finacle solutions suite on the Microsoft Azure, the enterprise-grade, cloud computing platform. Many companies have been exploiting the numerous opportunities offered by outsourced customer care services market to extend their profit margins and meet client requirements. These services help businesses better manage their consumer base and cater to their requirements in a rather efficient manner. Companies of late, have been adopting cloud technology and big data analytics, which will spur outsourced customer care services industry. In addition, the rising technological advancements and varying customer requirements will propel the business trends. LATAM outsourced customer care services market is anticipated to carve out a lucrative growth path over the coming seven years. This growth can be credited to the increasing English-speaking population and the growing penetration of the Internet. Besides, the reduction in telecom rates and the presence of highly educated agents will also spur the regional growth. LATAM also has a significantly large Spanish-speaking population, and offers the advantage of bilingual agents. Besides, the geographic proximity to the U.S. is another driving factor that makes the region a popular outsourcing destination, propelling LATAM outsourced customer care services industry. Outsourced customer care services market can be characterized by increased sales and high revenue, provided the players offer high-grade services such as contact center and managed charging & routing. In order to enhance the overall user experience, companies have been offering multichannel and multitiered technical and business support, in addition to network troubleshooting and other services. Helpdesk services are also provided by companies to improve retention, thereby fueling outsourced customer care services industry. CRM technology hosting is one of most lucrative service segments of outsourced customer care services market. The demand for low cost services is expected to augment the growth of this service segment over the coming seven years. CRM technology provides flexible solutions for various consumer problems and helps them use the features as they desire. Besides, it has been observed that most firms are reluctant to shift their service offering to multiple channels, which will further spur outsourced customer care services industry share from CRM technology hosting services. Outsourced customer care services market share from customer interaction is expected to rise significantly over the coming years. This growth can be attributed to the huge demand for quick problem recovery solutions. The primary aim of outsourced customer care services industry providers is consumer satisfaction, which will propel the business demand for customer interaction in the future. Subject to the goal of building and maintaining consumer relationships and fulfilling their demands in a way that they find convenient, outsourced customer care services market from customer interaction will gain a competitive edge over the next few years. North America is one of the most lucrative business grounds for outsourced customer care services. Pertaining to huge demand for high quality consumer care and the rise in the infrastructural facilities, North America outsourced customer care services industry is anticipated to grow remarkably over 2017-2024. Besides, pertaining to the presence of skilled labor at low costs, companies have been outsourcing their operations to Asian countries such as India and Philippines, which will substantially propel North America outsourced customer care services market. Besides, the high cost of resources in the continent is further stimulating the regional demand. The U.S. is slated to be one of the key revenue contributors. The competitive landscape of outsourced customer care services industry includes the participation of numerous giants such as Transcom Worldwide, Expert Global Solutions, Convergys Corporation, Aegis, Accenture, StarTek, Synnex Corporation, and Amdocs. While outsourcing services, it is essential to choose the most appropriate vendor. On these grounds, companies execute several testing methodologies to verify if their outsourced service portfolio is being launched with a reliable, well-known vendor. These corporations are being increasingly drawn toward the adoption of cloud computing and host-based services pertaining to their high efficiency and reasonable costs. Players operating in outsourced customer care services market also have to comply with the changing requirements of consumers and must be able to deliver services via multichannel solutions. This entry was posted in Electronics and Media and tagged CRM Technology Hosting, Customer Interaction, Fulfillment, Logistics, Outsourced Customer Care Services Market, Outsourced Customer Care Services Market Analysis, Outsourced Customer Care Services Market Forecast, Outsourced Customer Care Services Market Growth, Outsourced Customer Care Services Market Share, Outsourced Customer Care Services Market Size, Outsourced Customer Care Services Market Trends. Growing focus on infrastructure growth coupled with an increase in real-estate investments are predicted to boost the demand for aerial work platform trucks. Furthermore, the rising need for material handing in factories as well as in production activities is expected to boost the industry trends over the coming years. 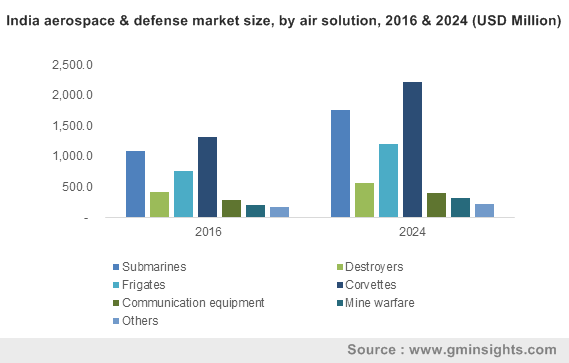 According to Global Market Insights Inc., “Aerial Work Platform (AWP) Truck Market share worth USD 2.4 billion in 2015, is estimated to reach USD 11 billion mark by 2024, growing at a CAGR of 18.5% over the period of 2016-2024.” Modernization in electrically propelled elevating platforms to fulfill emission norms and address the ecological concerns is expected to benefit the market in future. AWP trucks are predicted to find their use in various industries owing to its safety features, maneuverability, and ease of handling features. The rising installations of power cables and transformer & street light maintenance is predicted to boost the market trends over the coming years. Large scale use of AWP trucks in mining & construction activities due to the high risks involved in the work is predicted to benefit the market. The rapid growth of telecommunications industry due to the growing number of smartphone users will fuel AWP truck demand. These vehicles find their use in event management activities such as organization of corporate events, conventions, conferences, festivals, formal parties, and concerts. They are also used in disaster management operations as well as defense activities. AWP truck applications in the construction industry is predicted to be worth USD 4 billion by 2024 owing to big construction projects along with heavy infrastructural growth. Logistics & Transportation industry is also predicted to witness high market penetration over the coming years, with vehicle applications worth USD 550 million in 2015. Asia Pacific AWP truck market is forecast to record a CAGR of 18.7% over the period of 2016-2024 due to the growing number of mobile phone users coupled with the requirement of good telecommunication infrastructure. North America AWP truck market size is anticipated to witness a substantial growth over the forecast timeline. U.S. market is predicted to contribute noticeably towards the regional growth due to high capital investments along with an increase in the renovation work activities in the country. Driven by various applications in the construction, telecommunications, and transport & logistics industry, AWP truck is deployed in the form of vertical mast lifts, boom lifts, personal portable lifts, and scissor lifts. 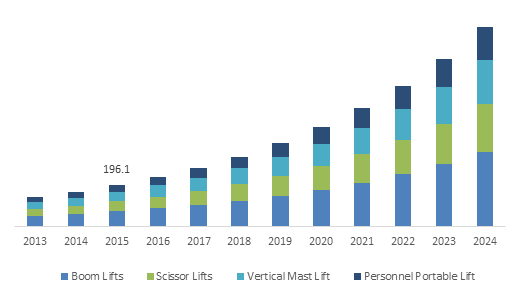 Scissor lifts AWP truck market is predicted to grow at a CAGR of 18.3% over the period of 2016-2024 owing to its increasing demand in various applications requiring direct overhead access. Boom lifts AWP truck market contributed over 35% of the global industry share in 2015 and is expected to dominate the industry over the forecast period. Rising use of the vehicles to enable entry in blocked areas is projected to boost the industry demand. Key industry players include Terex Corporation, Haulotte, Ruthmann, Aichi Corporation, Tadano Limited, CTE, Shen Yang North Traffic Heavy Industry, Hunan Runshare, Time Benelux, and Teupen. This entry was posted in HVAC and Construction and tagged Aerial Work Platform Truck Market, Aerial Work Platform Truck Market Research, Aerial Work Platform Truck Market Share, Aerial Work Platform Truck Market Size, AWP Truck Market, Boom Lifts, Construction, Global AWP Truck Market, Government, Logistics, Personal Portable Lifts, Scissor Lifts, Telecommunication), Transport, Vertical Mast Lifts.